Block B are having a comeback this month and their comeback single is revealed to be 'Jackpot'. 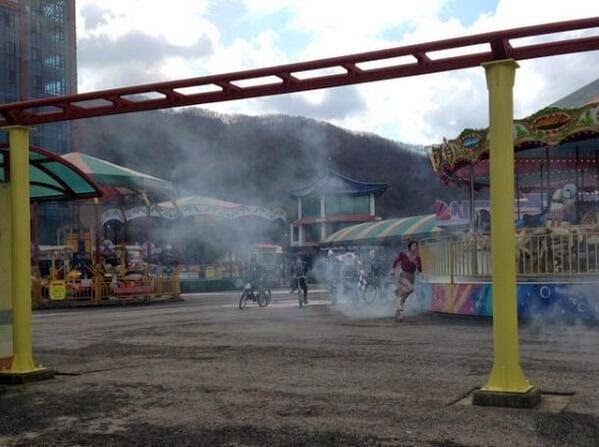 A photo from their MV shooting is released showing a crowd riding bicycles while chasing a girl in an amusement park. The girl is revealed to be actress Kim Saeron who is going to make an appearance on Block B's new MV. In addition to that, a photo teaser will be released on April 9 at noon and the MV would be on April 14. The single titled 'Jackpot' is scheduled to be released on April 17. Meanwhile, Block B are holding their first solo concert in Seoul on May 17-18 and Busan on May 23-24. Are you excited for their comeback?